TheaterWork’s production of the musical “Next to Normal” led the nominations for the 27th annual Connecticut Critics Circle Awards event to be held Monday, June 26 at 7:30 p.m. at Sacred Heart University’s Edgerton Center for the Performing Arts in Fairfield. The show received a total of 10 nominations, including best musical. Westport Country Playhouse’s production of Ayad Akhtar’s play “The Invisible Hand” led the non-musicals, receiving seven nominations, including outstanding play. Other outstanding play nominees are: “The Comedy of Errors” at Hartford Stage; “Mary Jane” at Yale Repertory Theatre; “Scenes From Court Life” at Yale Repertory Theatre and “Midsummer” at TheaterWorks. Also nominated for outstanding musical are: “Assassins” at Yale Repertory Theatre; “Bye Bye Birdie” at Goodspeed Opera House, “Man of La Mancha” at Ivoryton Playhouse and “West Side Story” at Summer Theatre of New Canaan. The awards show, which celebrates the best in professional theater in the state, is free and open to the public. Three-time Tony Award-nominee Terrence Mann will be the master of ceremonies for the event. Mann joined the Connecticut theater community this year as artistic director of Connecticut Repertory Theatre’s Nutmeg Summer Series at the University of Connecticut at Storrs. Last year’s top honorees -- Yale Repertory Theatre’s play “Indecent” and Hartford Stage’s musical “Anastasia” -- are currently on Broadway. 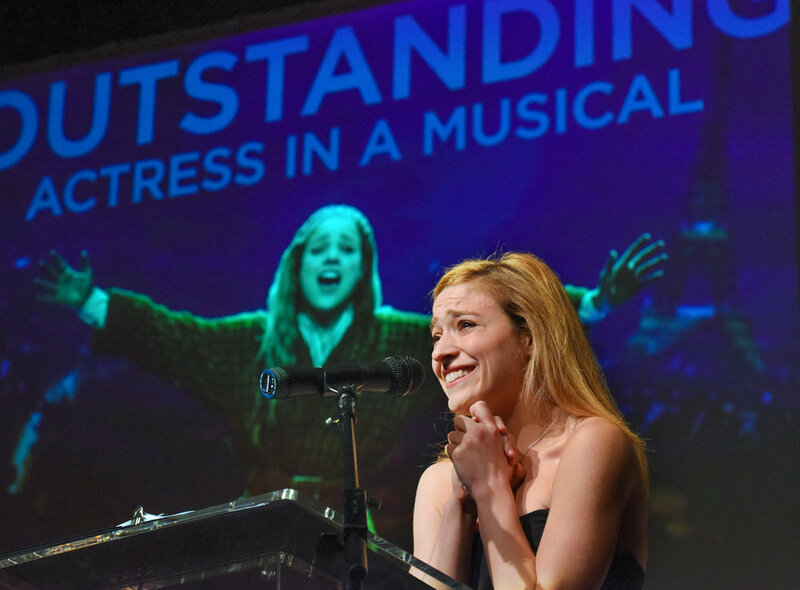 Christy Altomare accepting outstanding actress in a musical award for "Anastasia"
Actor in a play: Jordan Lage, “Other People’s Money,” Long Wharf Theatre; Tom Pecinka, “Cloud Nine,” Hartford Stage; Michael Doherty, “Peter and the Starcatcher,” Connecticut Repertory Theatre’s Nutmeg Summer Series; Eric Bryant, “The Invisible Hand,” Westport Country Playhouse; M. Scott McLean, “Midsummer,” TheaterWorks. Actor in a musical: Robert Sean Leonard, “Camelot,” Westport Playhouse; Riley Costello, “How To Succeed In Business Without Really Trying,” Connecticut Repertory Theatre’s Nutmeg Summer Series; David Harris, “Next To Normal,” TheaterWorks; David Pittsinger, “Man of La Mancha,” Ivoryton Playhouse; Zach Schanne, “West Side Story,” Summer Theatre of New Canaan. Actress in a musical: Ruby Rakos, “Chasing Rainbows,” Goodspeed Opera House; Christiane Noll, “Next to Normal,” TheaterWorks; Julia Paladino, “West Side Story.” Karen Ziemba, “Gypsy, Sharon Playhouse; Talia Thiesfield, “Man of La Mancha,” Ivoryton Playhouse. Director of a play: Darko Tresnjak, “The Comedy of Errors,” Hartford Stage; David Kennedy, “The Invisible Hand,” Westport Country Playhouse; Marc Bruni, “Other People’s Money,” Long Wharf Theatre; Tracy Brigden, “Midsummer,” TheaterWorks; Gordon Edelstein, “Meteor Shower,” Long Wharf Theatre. Director of a musical: Rob Ruggiero, “Next to Normal,” TheaterWorks; David Edwards, “Man of La Mancha,” Ivoryton Playhouse; Melody Meitrott Libonati, “West Side Story,” Summer Theatre of New Canaan; Jenn Thompson, “Bye Bye Birdie,” Goodspeed Opera House; Kevin Connors, “Gypsy,” Music Theater of Connecticut in Norwalk. Choreography: Denis Jones, “Thoroughly Modern Millie,” Goodspeed Opera House; Chris Bailey, “Chasing Rainbows,” Goodspeed Opera House; Doug Shankman, West Side Story,” Summer Theatre of New Canaan; Patricia Wilcox, “Bye Bye Birdie,” Goodspeed Opera House; Darlene Zoller, “Rockin’ the Forest,” Playhouse on Park. Ensemble: Cast of “Smart People,” Long Wharf Theatre; Cast of “Trav’lin’ ” at Seven Angels Theatre; cast of “Meteor Shower,” Long Wharf Theatre; cast of “Assassins,” Yale Repertory Theatre; cast of “The 39 Steps” at Ivoryton Playhouse. Debut performance: Maya Keleher, “Next to Normal,” TheaterWorks; Dylan Frederick, “Assassins,” Yale Repertory Theatre; Nick Sacks, “Next to Normal, TheaterWorks. Solo Performance: Jodi Stevens, “I’ll Eat You Last,” Music Theater of Connecticut; Jon Peterson, “He Wrote Good Songs,” Seven Angels Theatre. Featured actress in a musical: Maya Keleher, “Next to Normal,” TheaterWorks; Jodi Stevens, “Gypsy,” “Music Theater of Connecticut; Katie Stewart, “West Side Story,” Summer Theater of New Canaan; Kristine Zbornik, “Bye Bye Birdie,” Goodspeed Opera House; Kate Simone, “Gypsy,” Music Theater of Connecticut. Set design: Colin McGurk, “Heartbreak House,” Hartford Stage; Michael Yeargan, “The Most Beautiful Room in New York,” Long Wharf Theater; Wilson Chin, “Next to Normal,” TheaterWorks; Adam Rigg, “The Invisible Hand,” “Westport Country Playhouse; Darko Tresnjak, “The Comedy of Errors,” Hartford Stage. Costume design: Ilona Somogyi, “Heartbreak House,” Hartford Stage; Marina Draghici, “Scenes from Court Life,” Yale Repertory Theater; Fabio Toblini, “The Comedy of Errors,” Hartford Stage; Gregory Gale, “Thorough Modern Millie,” Goodspeed Opera House; Lisa Steier, “Rockin’ the Forest,” Playhouse on Park. Lighting design: Matthew Richards, “The Invisible Hand,” Westport Country Playhouse; Yi Zhao, “Assassins,” Yale Repertory Theatre; John Lasiter, “Next to Normal,” TheaterWorks; Matthew Richards, “Comedy of Errors,” Hartford Stage; Christopher Bell, “A Moon for the Misbegotten,” Playhouse on Park, Hartford. Sound design: Jane Shaw, “The Comedy of Errors,” Hartford Stage; Fan Zhang, “Seven Guitars,” Yale Repertory Theatre; Shane Rettig, “Scenes from Court Life,” Yale Repertory Theatre; Karen Graybash, “The Piano Lesson,” Hartford Stage; Fitz Patton, “The Invisible Hand,” Westport Country Playhouse. Hugh Jackman Eyeing Christopher Shinn Play?